Installing Ubuntu Linux on a Netbook: Do you want to install Ubuntu or any other Linux distribution on your netbook? If yes, then allow me to show you the necessary steps needed in order to do so. 1. First, you will need to download an Ubuntu ISO installer from HERE. If you want, you can also check out some other Linux distributions for netbooks. Also, make sure you have an empty USB thumbdrive that we will use later on. 2. Next up, download and install UNetbootin. It's available for Windows and Linux systems, and you can get it from HERE. 3. 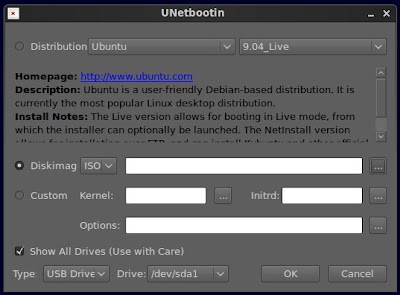 After installing Unetbootin, let's use it to create a bootable Ubuntu Live USB installer. The Unetbootin GUI has a very simple GUI. Just select or specify a distribution (in this case Ubuntu), disk image, and target drive, and then press "OK". 4. Now relax and let Unetbootin extract and copy the files and install bootloader. After that, you will be asked to reboot. 5. While your netbook is starting, press the necessary button (usually F1, F2, F12, ESC, or backspace) to get to the BIOS boot menu, and then select USB drive as the boot target. After that, Ubuntu should load and you can either test Ubuntu or install it right away. During installation particularly while partitioning, you will be given an option to dual boot Ubuntu together with Windows (or whatever OS your netbook has) or to completely replace that OS. Ubuntu is really easy to install (easier than installing Windows) so you should have no problem whatsoever. But still, it's essential to back-up all your important files. You may want to use any of the backup software for Linux. Are you still thinking or apprehensive about installing Ubuntu Linux on your netbook? -Just do it! Got a Dell Mini 9 two years ago and that was the first Linux I owned (i often tested LiveCDs). My wife hated it with such a passion, that she said, "Put windows on it." I was playing around with Mandriva and Kubuntu around that time so I discovered how to use Unetbootin and got it to work with the netbook. I now have an Asus for my own needs (kids practices!) and have installed Kubuntu, Mandriva Netbook, Puppy and Arch all with KDE4.x and havent had problems so far. Unetbootin made it very, very easy. Ok, now what? Its installed but does everything work? Does the battery last as long as Windows? Why only review installing? I had to use unetbootin with a laptop whose hard drive had died a while ago and found it extremely useful. This resulted in the laptop's owner having an inoperable system due to viruses to being transitoined to Ubuntu.